This was the binary system stirring spacetime like a giant spoon made of neutronium, sending out waves of gravitational radiation. What I didn’t have time to explain was why PSR J0348+0432 was so perfect. 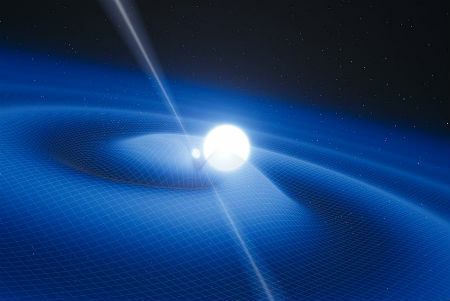 A neutron star is as dense as matter can get without sinking out of all sight behind an event horizon. Even if light can escape, most matter can’t, and the neutron star grows as it consumes everything around it. If it’s spinning this creates jets along the axis, high energy particles squirted out at the poles. If the whole thing is rotating around another axis (imagine a wobbling spinning top – the top is spinning around its axis, but that axis is rotating around and around as well) these polar jets sweep out a circle around the universe. If you’re in the path of this beam, you’ll see a regular pulse as it sweeps past. That’s why it’s called a pulsar. The most compressed mass engine possible thus powers a combination of a cosmic lighthouse and the speaking clock. These pulsars are the most accurate timekeepers possible: when you have for octillion tonnes spinning twenty five times a second, there’s very little you can do to stop it. That’s something twice the mass of the sun twisting at 1500 rpm. At least ten rotations in less time than it takes you to blink. And the whole thing made of solid neutronium: that’s a grindstone which could cut Mjolnir to powder and not even notice. It’ll run down eventually, as all things will, but you’d need to sacrifice a star to alter its timing in any way we’d be around to notice. So you’ve got the most unstoppable clock in the universe, slap-bang in the middle of the spacetime distortion system we want to measure. It’s the most perfect experiment possible. If astrophysicists had access to God’s sandbox menus, that’s the experiment they’d build with their cosmic Gmod. Theory predicts that the loss of energy in sending out gravitational waves will cause the pulsar and white dwarf to spiral closer together, shortening their orbit. The measurements matched this theory. The measurements were also 8.6 plus or minus 1.4 millionths of a second, per year, measured from over six thousand light-years away. That’s a measurement of one part in three thousand billion. That’s precision. That’s science. And that’s what people should remember the next time they see someone with shiny teeth and a chat show wibbling about “alternative” theories. For more spectacular sciencery, I enjoy the echoes of creation known as Baryonic Acoustic Oscillations, and the pure plasmapunk that is the Z Machine. This entry was posted in SCIENCE and tagged bonus content, scienceiseverything. Bookmark the permalink. Science isn’t my thing. I’ve always liked it, but it wasn’t interesting enough for me to make that my career. Thank god people like you are around to show me how wrong I was. I don’t think I’ll ever be a scientist, but I can at least watch from the tribunes, be amazed, and hopefully help as much as I can, if only by spreading the love for science.